I heard about Hechingen from Ms. S and Mr. N, our hosts in München, who described it as an insider tip – the most famous Hohenzollern castle is at Sigmaringen, but this one, at Hechingen, is a hidden gem. it reminded me of a book with germanic fairytales from when i was a kid, where they were talking about a dark count of Zollern. 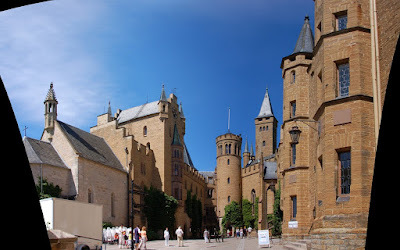 was the impressive Hohenzollern burg, site of origin for the famous royal family of Hohenzollern. to finally get to the fortress gate. of course featuring a canon, skillfully operated by a brave warrior. Did the fortress tour, guided, unfortunately no pictures. Pretty neat. One of the highlights was the family tree right at the beginning, featuring Carol I, Carol II, Ferdinand I and Michael I of Romania – the kings of Romania between 1881 and 1947 were from the Hohenzollern family. After the tour, i checked out the dungeons (is this the word? 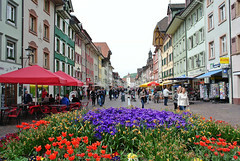 ), where you can see the rock which the foundation was built on, and some cool corridors.